Are you looking to move your SharePoint 2013 on premises environment to SharePoint Online and reap the benefits of Microsoft’s cloud platform? If you answered yes, you might be aware of just how big of a task moving from SharePoint 2013 to SharePoint Online is. Dependent upon how much data you have, a move to the cloud can costs tens of thousands of dollars. Not only do you need to plan, onboard and drive adoption of the new platform – you need to ensure that data is not lost along the way. Microsoft has announced a limited-time offer of migration services from on-premises SharePoint 2013 to Office 365—available at no additional cost to eligible Office 365 customers until March 31, 2017. This offer is available to customers with at least 150 licenses for an eligible service or plan for their Office 365 tenant. For customers who take advantage of this offer, the FastTrack team will assess your SharePoint 2013 environment, and help you build and execute a plan to migrate from your on-premises team sites and MySites to SharePoint Online and OneDrive for Business, respectively. 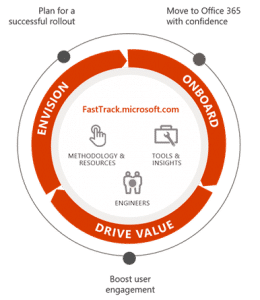 Working with a Microsoft Partner like 6th Street Consulting will not only aid in your FastTrack migration, but can provide valuable services during and after the execution. One of the keys to any successful migration, once an organization has deployed the new tools, is to make sure people are learning and using them. 6SC offers a comprehensive range of services to aid companies of all sizes in taking full advantage of Office 365 and SharePoint Online. 6th Street Consulting, the 2013 Global Microsoft Partner of the Year Winner for Collaboration & Content, is a strategy and technology consulting firm located in Redondo Beach, California. 6SC is a company built on user productivity and team collaboration. Allow us to implement our time-tested features with years of development and user testing behind them. Our SharePoint solutions help you to get more out of each and every work day. Integrated features across applications save time and allow you to focus on efforts that add value and profitability. Set yourself apart and grow your business by sharpening your competitive edge with 6SC.